Hi Crafters! Today's project is from a talented guest designer, Dawn Montagano, a fellow CTMH consultant. She has made this awesome candle decoration for the Thanksgiving season using the "So Grateful" stamp set. This is part of her current "Virtual Club" kit! The piece that goes around the candle and the leaves are found on page 78 in the Artiste booklet. I used the Card/Shift image set at 3” with Clementine paper for the decorative band around the candle. The leaves are cut from Moonlight paper in 2”, 2 ½” & 3” sizes. The oval pieces of cardstock were cut using the Art Philosophy cartridge (oval shape 3). I used one Colonial white 2” oval for the background; it is distressed with Saddle ink and attached with foam tape. 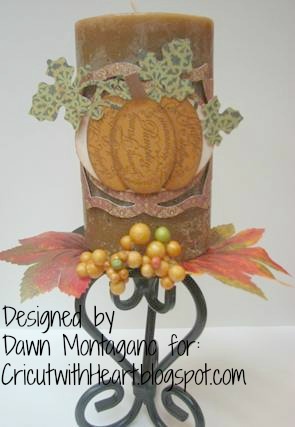 The pumpkin ovals are cut from Goldrush cardstock at 1 ¼”. Here is also where I used the “So Grateful” stamp set. Using the word layer stamp with Saddle ink, I stamped each of the pieces – right, left and middle with that part of the stamp and ink distressed all of the edges. The right and left oval pieces are attached flat to the background oval. The middle oval is attached with 3D foam tape to give it dimension. I used a small piece of Saddle cardstock (about ¾ x 1 ¾”) rolled into a tube for the stem and attached it under the raised middle piece. Here is what the rest of her kit looks like. 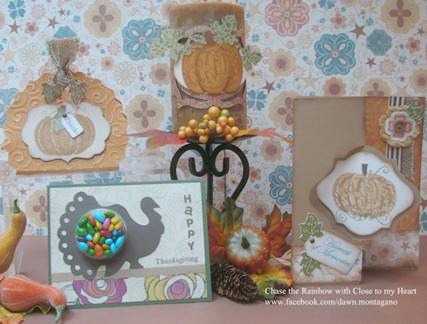 She said she was inspired by Mary's Pumpkin Treat Boxes with Artiste from her Sept 6 post, so she wanted to share her creations with us as well! Thanks for sharing, Dawn! That is so awesome!!! Thank you Melinda we are honored!! !